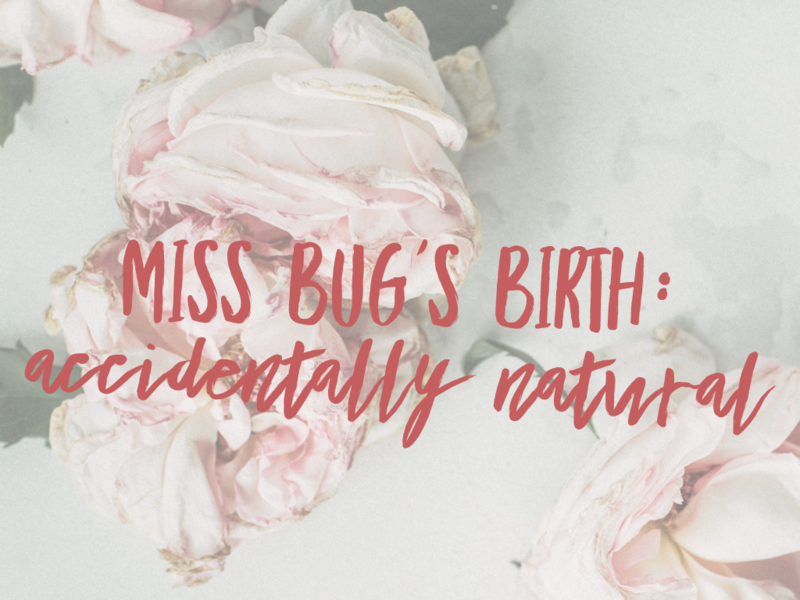 Read about my two previous births! The Ballerina’s Part1 and Part 2, and the Engineer’s. Between the Engineer and my next pregnancy, we moved. I was at a new clinic, a new hospital and had a new doctor, Dr. P. We were in a new house and new neighborhood, but family problems follow you everywhere. My stepdaughter dropped out of high school and moved out, a decision that was both stressful and a relief. It removed a source of tension in the household without actually removing any worry. Emotionally, my third pregnancy felt a great deal like a desert. While we were happy to be expecting again, I felt like an enormous failure as a mother. At the same time, our parish lost its priest and was not assigned a new one until after Miss Bug was born. In a time when I especially needed the renewal of my faith, the resources for it were not there. I did not know then that depression could occur during pregnancy–antenatal depression as opposed to the better-known postpartum depression. Everything felt dry and empty for most of those long months. Ever thought you had this birth thing figured out? Yeah, I did too. Boy, was I wrong! Physically, this was also my hardest pregnancy. The first four months felt like endless food poisoning. I don’t know if it was a reaction to the high stress of the previous year(especially the four months immediately before conception), a result of my poor diet (highly processed and not very nutritious), or was simply a quirk of that particular pregnancy. I had not and have not had morning sickness like that in any other pregnancy. However, the only other issue with the pregnancy was my susceptibility to bacterial vaginosis, which isn’t as uncomfortable as a yeast infection, but can cause premature labor. It is also treated with the most vile antibiotic I have ever, ever taken in my life. The antibiotic used for it turned my tongue green, made everything taste horrible, increased my nausea, and left me feeling more lethargic and drained than the pregnancy. It’s horrid stuff, even if it works. As labor approached, I planned a birth much like the one I had with the Engineer: give me that epidural ASAP! However, I had never gone into labor while at home, and I wasn’t sure when to come to the hospital. I couldn’t count on having a checkup that coincided with my “labor day,” like last time, and I couldn’t exactly get down there and see how dilated I was. Dr. P told me that the usual guidelines were to come in when the contractions were 5 minutes apart. Just in case, I bought a copy of The Birth Book by Dr. William Sears. It’s a good thing I did, because it was the only preparation I made for what was coming. The Monday before my due date (I was due that Friday), I lost my mucus plug. I probably wouldn’t remember that, but I went to my Moms’ Book Group that night, and my impending birth was a big topic of conversation. One of the moms there was our local neonatal nurse, and I mention the mucus plug to her. “Oh, that baby is coming soon,” she predicted. She was right. All the baby and birth books, though, tell moms not to get excited about it. Labor and delivery nurses roll their eyes if a mom walks in and says she lost her mucus plug and labor is coming. 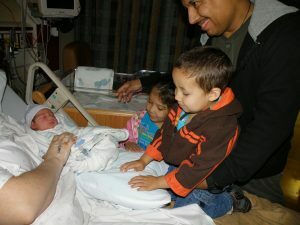 (Poke around Pinterest to find this one; search “Labor and Delivery Nurses”). I figured I had another full day at least, but I did double check my hospital bag when I got home that night. Good thing I did! I woke up at 2 am with contractions. Not bad ones, but intense enough that I couldn’t sleep. They were about ten minutes apart. I walked around the house a bit. For a little while, sitting in the rocking chair was comfortable. As the contractions got more intense, but no closer together, I would bend over and lean on the back of the couch, which helped me relax my uterus. I felt chilled, so I ran a deep bath and laid in the water on my side, which had the double effect of easing the contractions and letting me doze a little. When the contractions became too intense for that, I got out. The contractions were about 6 minutes apart now, close enough to five, so I woke my husband, threw on some clothes and called my parents. They lived just across town. In the twenty minutes between waking my husband and my parents arriving, my contractions became much more intense, enough that sitting through one was very uncomfortable. But we live less that ten blocks from the hospital, so I figured I would have lots of time to get there, check in, be bundled into a room, and all the other rigmarole. It was nearly 4 am, so we had to be buzzed in through the emergency room entrance. Thankfully, we didn’t have to convince the nurses that, yes, I really was in labor. This was no false alarm. It was obvious. I don’t know how long we stood in the waiting room outside the labor and delivery hall (our hospital isn’t big enough for a L&D ward), but it felt like a long time, and the contractions were coming thick and fast. I wanted that epidural, now! I’m sure, though, that it was too late by the time I left home. I was much farther along than I thought, but I didn’t know that. I thought I was looking at hours and hours of these heavy, fast contractions. Fear didn’t help, I knew, so I focused on relaxing through them like before. Once in the room, the nurses were in a hurry, getting me into the hospital gown, taking my blood pressure, trying to get me to fill out paperwork, trying to get me on the bed to check my progress. All I knew is that I was losing it. I leaned on my husband, gripping his coat–he hadn’t had a chance to take it off–with each contraction. Over and over, I apologized to the nurses. I felt like I was such a bother, rushing in like this, making a scene. Nothing the nurses said made me feel that way; that’s just me. I suppose repeating, “I’m sorry, I’m sorry,” is better than cussing at them. Then my water broke all over the floor. I didn’t realize it at first. Everything down there either hurt or was numb, and sensations weren’t exactly reaching my brain with much accuracy, or being analysed well. I thought I’d peed all over, and I was mortified. The nurses insisted I get on the bed for a check. About the time I did, I felt it. I needed to push. I needed it more than anything I had ever needed, and I told the nurses so. Miss Bug was not going to wait. She came in 3 hours flat! One left to get Dr. P. The other helped brace my leg and told me to go ahead and push. One, two, three, and little Miss Bug was born. I think Dr. P came in time to catch, but I’m not sure. Miss Bug was bundled into a warmed blanket and handed to me. She snuffled around, found the breast and started to nurse. I know I delivered the placenta and got cleaned up, but I don’t remember it. I had my baby in my arms, healthy, red and perfect–a beet with a brushcut–and I had survived a natural birth completely by accident. Then the anesthesiologist showed up. Of course, they had called him, woken him up, then he had to drive in, and prepare everything for an epidural . . . and it was totally unnecessary. He is the husband of the neonatal nurse, so I sent him home to tell her the good news. Miss Bug was born at 5:04 AM, almost exactly three hours after labor began. I had been in my hospital room less than an hour. Thankfully the depression that had dogged me throughout the pregnancy evaporated within a day of birth. 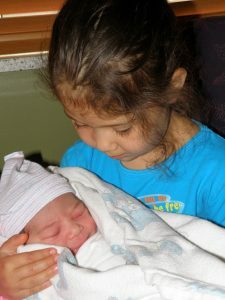 I had been so sick during my pregnancy with Miss Bug, but she made up for it after the birth. She was a placid, happy baby, and figured out her days and nights within 48 hours. None of my other children have been such good sleepers. I admit, for a little while I thought I had just gotten that good at parenting babies. I had it figured out. In reality, that was just Miss Bug. She is still a heavy, good sleeper. I was surprised by how quickly she and I both recovered from the labor. Recovering from it was much easier than recovering from the Engineer’s birth, even though he’d been an easy, relaxing, mostly painless labor, and this one had been a whirlwind. That easy recovery was enough to make me want to try natural birth again. There’s a lot of advice out there about how to have a short labor: what to eat or how to exercise for that perfect, quick, natural birth. I stumbled into it totally unawares. After talking to my mother about her labors, I’m convinced there’s a genetic component to laboring. I’m also convinced that every expecting mom needs to learn how to relax through contractions, how to use visualization to help her, and how to keep calm and in control when it is so tempting to panic. Next Post Curly-Top’s Birth: Finally Going as Planned!